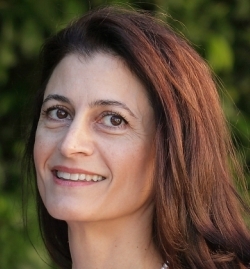 Lena Borboudaki holds a degree in Public Administration and an MA, and is currently a doctoral candidate at the University of Crete. She has specialist knowledge gained in numerous administrative, organizational and advisory projects, and has built a successful career in public administration by acquiring experience in positions of responsibility. Lena has served as deputy director of Heraklion University General Hospital and co-ordinator of the Heraklion Prefecture Parents’ Academy, where she proved methodical, hard-working and effective while in overall charge of operational organization and administration, human resources and financial management. In her new post the management is contributing to the smooth running of the Museum exhibition, aiming to enhance public information provision, educational programmes, scientific research and creative recreation. Olga Berdiaki lives and works in Heraklion. 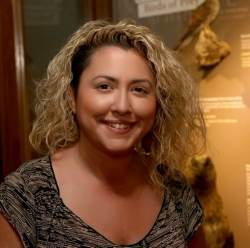 Having studied preschool teaching and museum education, she decided to combine knowledge from both fields in organizing educational activities for children and their families in museums and other spaces. While freelancing over a number of years, she gained experience in theatre games, handicrafts, puppet and shadow theatre, fairytale telling, organizing children’s parties, indoor and outdoor summer youth camps, and of course in establishing and encouraging educational programmes in museums in Heraklion and Athens. 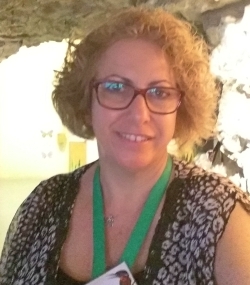 Olga first worked with the Natural History Museum of Crete in 2001 and has continued ever since, with a whole host of programmes, family events, educational packages, children’s summer events, festive workshops, puppet theatre and a great deal more. Her aim is to turn visiting the museum into exploring, learning into playing and memories into aids for new adventures. Evridiki was born in the northern Greek town of Goumenissa. On graduating from the Department of Forestry and the Environment at the Aristotle University of Thessaloniki (1994), she worked as a project expert in public forestry departments in Macedonia, Samos and Crete, and as the head of airborne forestry fire-fighting services in Attica. She has participated in various conferences and day symposiums. 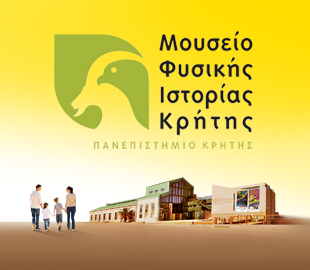 Evridiki’s love of the natural environment brought her into contact with the Natural History Museum of Crete, where she first worked in 1997 as a volunteer at a temporary exhibition in Chania. She was then employed on a fixed-term contract at the NHMC’s first permanent exhibition in Heraklion, and from 2001 onwards participated in various research and applied projects at the NHMC. In 2004, as a forester in the Crete Region Forestry Directorate, she collaborated with the NHMC on projects to protect the bearded vulture and biodiversity in Crete, as part of the Life-Nature 2002 programme. Since 2010 she has worked as a guide in the new NHMC exhibition, also assisting the museum’s education team in planning and running programmes and other activities. Evridiki enjoys encouraging children to do handicrafts and artwork inspired by the natural environment. She speaks fluent English and a little Russian. Panos Yeorgantis was born on 5th December 1984. 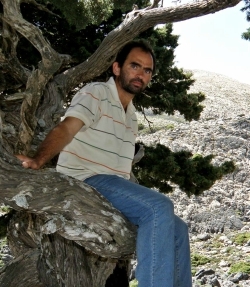 He grew up on Chios, and in 2002 enrolled in the University of Crete Biology Department. On completing his degree he went on to a postgraduate programme in the same department, specializing in Environmental Biology and doing research on land snails. Since 2007 he has worked at the NHMC exhibition, mainly assisting with visitor communication and in running the museum’s educational programmes. Panos speaks English and German. He enjoys planning and running programmes and events, as well as discussing topics in science with visitors of all ages. In his free time he takes part in theatre performances of all kinds. He also likes travelling and visiting science and natural history museums in other cities. Zoe Liandraki is an agricultural technician, with a first class degree from the Crop Production Department at the Technological Educational Institute of Crete. She is also a graduate of the Department of Greenhouse Crops and Floristry. As an entomology and ecology specialist she has given papers and oral presentations at Greek and international conferences. Zoe first came into contact with the MNHC in 2011, during a six-month student internship in the Arthropod Lab, and joined the museum the following year. Having trained in museum education, she takes part in planning and leading our programmes. She was also jointly responsible for preserving insects and other arthropods for the “Biodiversity and Geodiversity of Crete” exhibition. Zoe Mavritsaki studied Biology at the University of Crete. She then worked as a sales assistant in bookshops and at book exhibitions, and in the OTE telephone faults call centre. In 2014 she joined the team at the NHMC Hydrobiology Lab as part of a research programme studying the ecological state of Crete Water District, and in the 2015-2016 school year taught physics and biology at the municipal welfare supplementary school. 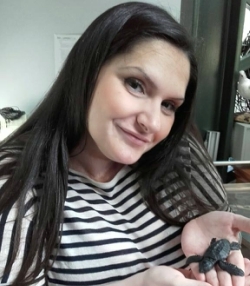 Since February 2017 she has worked at the NHMC, mainly as a leader for educational programmes and children’s events, an exhibition guide and guard, and occasionally as a receptionist and museum shop assistant. Konstantina Mousouri was born in Heraklion. From the age of seven onwards she lived in Berlin, where she attended the city’s Greek High School. 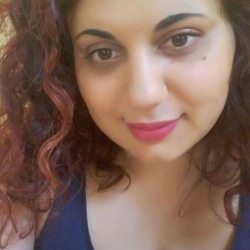 She came back to Greece as a 19-year-old to study Biology at the University of Crete, and then went on to train as an accounts and taxation office employee. She has worked at the NHMC since March 2010, starting as a German-language visitor guide, and later as an educational programme leader for school groups and NHMC press officer. Konstantina is now our finance officer and museum shop manager. 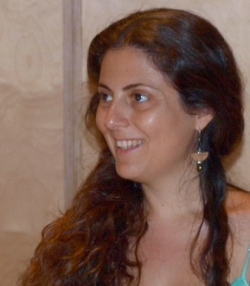 Stella Hereti studied Greek language and literature at the University of Athens, and was then awarded a state scholarship for postgraduate study in the same field. She has specialized in museum education since 2012, organizing and leading programmes. She has also worked at the Crete Museum of Medicine, where she assisted in planning and leading a programme entitled “Folk Medicine – Spells and Remedies”. 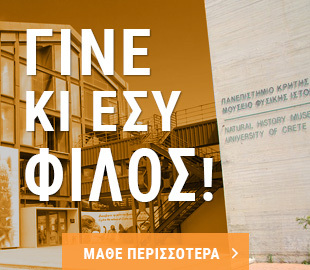 That formed the basis for her paper on “The educational experience at the Crete Museum of Medicine”, which she gave to an evening colloquium held in May 2016 on “Museum, school, family: co-forming cultural landscapes”. 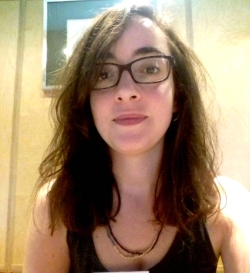 Stella spent three school years working at the Lychnostatis Museum of Traditional Life, and has also worked as a secondary school teacher and editor. 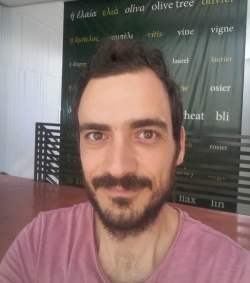 Yorgos Alexandrakis graduated from a Secondary College for Tourism Professions. 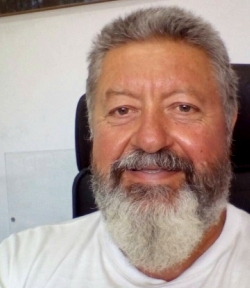 Having always had a great love of nature, and for misunderstood reptiles and arthropods in particular, he set his sights on joining the NHMC team. Since 2008 he has been responsible for day-to-day care of the museum’s live collection, and also takes part in museum field expeditions, where he is ever keen to learn new things. As Yorgos himself says, “Nature is a neverending school”. Vangelis Kouroupakis studied electrical and building maintenance at Heraklion Technical School. He first became involved with the University of Crete in construction work on the old campus on Knossou Avenue, where he was employed as an electrician. He then worked on major electrical projects and wiring installations for construction and technical firms. Ten years ago he joined the NHMC as museum electrician and building maintenance manager.